Xploree is back at AdTech, New Delhi – the largest digital marketing event of the year scheduled for 3rdand 4th March 2016. Ad: tech is a global digital marketing conference and exhibition where marketing, technology and media punters converge to forge partnerships and share ideas, strategies, insights and solutions on technology and marketing trends. A notable feature at AdTech is an exchange of ideas by marketers, technology and media communities to come up with solutions that address industry challenges. One of the problems plaguing marketers is consumer dissonance with the irrelevant and untargeted marketing of brands, services and products. Xploree is an award-winning contextual discovery platform that enables consumers to reach out to content, services in 1-hop from any app with a high degree of intent match. It is industry’s first user-initiated, multilingual keyboard technology that understands user intent with every use and displays relevant deals, discounts and offers from brands in the mobile moment. Xploree offers cross- app reach to users who can view the discoveries without exiting the conversation app. It presents an immense opportunity for consumers & brand marketers to engage with each other non-intrusively especially during chat ‘idle time’ or the “mobile interlude”. Mobile interlude is the short waiting time during a chat conversation when one person waits for the other to respond. During this brief moment, Xploree presents a window of opportunity for brands/services/content providers to connect with the users in their mobile moments. Xploree, has partnered with various brands such as Flipkart, Groupon, Snapdeal, Grabon, Yahoo etc. to deliver true discovery experience to mobile consumers. It is also pre-embedded as the keyboard on leading mobile devices by original equipment manufacturers (OEM) such as Panasonic, Coolpad to name a few. We will show a preview of the technology that powers this next generation mobile marketing solution whilst sharing testimonials from our brand partners. For instance, you will know how we helped brands cross engagement rates as high as 28% for certain categories. You will hear how numerous brands and marketers have found the apt solution to relevant, targeted and contextual mobile marketing that has helped achieve revenue targets. Got a problem. We have the solution. Pre-book a meeting slot with us at Adtech or alternatively drop by Booth No43 C at the event. Be prepared to discover the unexpected. Users are constantly interfacing with their mobile devices to share, socialize, consume and create content, avail services etc. Facebook and Whatsapp stand out as as the most popular apps based on user base. But the two other engagement touchpoints that see a high engagement –are Call and Keyboard. However, from the mechanical clicks to soft touch and touchscreens, the most widely used input device has not seen outstanding changes in the last few decades. Not many existing keyboards are recognizing its importance as an effective platform to build innovative consumer experiences. In the world of keyboards, users have a lot of choices. But the ones that will see more user love in the coming months and years will be the ones that have the capability to bring simplicity to content and service discoveries. Predictive and intent-based targeting mechanism to deliver relevant information to consumers on their mobile devices at that single point of intent is the game-changing disruption that is not present in most of existing keyboards available on Android or iOS. 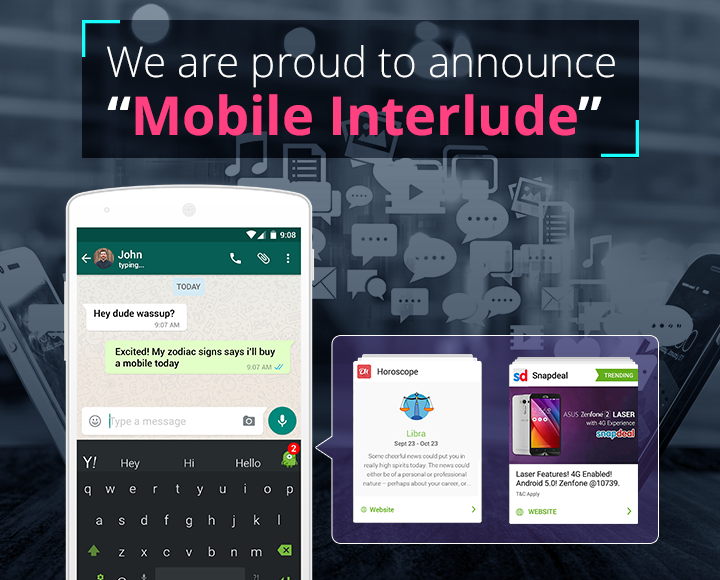 Keyboards are doing all kind of key things like autocorrect, themes, word prediction, multiple languages and emojis but there is hardly any competition when it comes to going beyond the expected and giving mobile users content and services discoveries that delight them in their exact moment of need. Noticeable amongst the partnerships is Xploree’s search tie up with Yahoo. The partnership offers users search and browsing of information in one tap across apps without exiting the conversation application. With 15% of app interactions on mobile devices being with a clear intent to search per Xploree’s user study, the integration has the potential to enable hyper-contextual search across apps on mobile to enhance the overall app experience. Xploree Keyboard brings in simplicity and insight to delight the users in their mobile moments whether the intent is to find a pizza place in the next minute or book air tickets for this weekend. Xploree users are enjoying streamlined experiences of finding relevant content or services without leaving the task they are engaged in. Try it out here: bit.ly/Xploree , and let us know what you think. A keyboard is the most commonly used device for direct (human) input of alphanumeric data into computers. While most keyboard keys produce letters, numbers or signs (characters), other keys or simultaneous key presses can produce actions or execute computer commands. Keyboards are doing all kind of key things like autocorrect, themes, word prediction, multiple languages and emojis but there is hardly any competition when it comes to going beyond the expected and giving mobile users content and services discoveries that delight them in their exact moment of need. A no fuss keyboard Xploree’s strong point is that it allows the user to be in control, granting a more enjoyable and a satisfactory consumer experience through nonintrusive, non-interruptive, relevant content recommendations. Xploree allows opt-in for personalized discovery across apps and then delivers deals, services etc. by understanding the consumer expressions and intent on the device thus putting the choice in consumers’ hands. Xploree has partnered with leading ecosystem players including Groupon, Grabon etc. and OEM majors who have pre-installed the platform on mobile devices. For instance, Coolpad’s latest mobile phone, the Coolpad Note 3 is pre-embedded with Xploree keyboard that pivots on delivering brand and services discovery on mobile with special attention to the privacy needs of the markets where it is shipped. Xploree has a search tie up with Yahoo. It offers users search and browsing of information in one tap across apps without exiting the conversation application. Xploree Keyboard brings in simplicity and insight to delight the users in their mobile moments be it finding a pizza place in the next minute or book air tickets for this weekend. Xploree users are enjoying streamlined experiences of finding relevant content or services without leaving the task they are engaged in. The partnerships and industry accolades for Xploree makes it clear that Xploree is the next BIG thing! You too experience it all yourself and you will get to know what you have been missing all this while.